One of the best things about being Washington, DC, wedding photographers is the impact you have on the people photographed. DC wedding photographers preserve happy memories of one of the biggest days of brides’ or grooms’ lives. They create images that remind future spouses of all the emotions they felt during their marriage celebrations in the Nation's Capital. Award-winning Washington wedding photographers take pictures that the newlyweds will be able to show their children and children’s children. With that in mind, the vast majority of the photos that DC wedding photographers deliver focus on the bride and groom. They are the two people getting married, of course! However, preserving memories of the day requires that a Washington, DC, wedding photographer expand their views. Award-winning wedding photographers in the Nation's Capital point their cameras at more than just brides and grooms posing for couples portraits. They capture images of everything else that happens at Washington, DC, weddings. They take pictures of the bride’s mother shedding a tear when the rings are exchanged. They photograph the groom’s father beaming with pride as his little man walks to the altar. They get pictures of the groomsmen clowning around as their friend/brother gets into his tuxedo. They create photographs of the bride sharing a champagne toast with her bridesmaids. Award-winning wedding photographers also take pictures of the extended family that typically attends a marriage celebration. This is an extremely important, but often overlooked, part of great DC wedding photography. We often hear from brides and grooms how much they value having pictures of their grandparents, aunts and uncles, and cousins. They tell us that their Washington, DC, weddings are one of the few times that everyone is together. Washington-area wedding photographers who can get meaningful family moments on film give their couples important reminders of those memories. In our work as Washington, DC, wedding photographers, we are always on the lookout for these kinds of shots. In particular, we keep our eyes open for and cameras ready to photograph scenes with an intergenerational focus. Pictures of the bride, her mother and her grandmother hugging are often the ones that the former treasures most. As a result, those images are some of the most meaningful that we capture at Washington, DC, weddings. Not all Washington, DC, weddings provide these kinds of moments, though. For a variety of reasons, extended family cannot always be present. In those cases, award-winning DC wedding photographers have to get a little creative. In this photo, for example, we managed to work three generations into the shot in a very subtle way. After the bride got into her wedding dress, she was modeling it for her bridesmaids and close relatives. 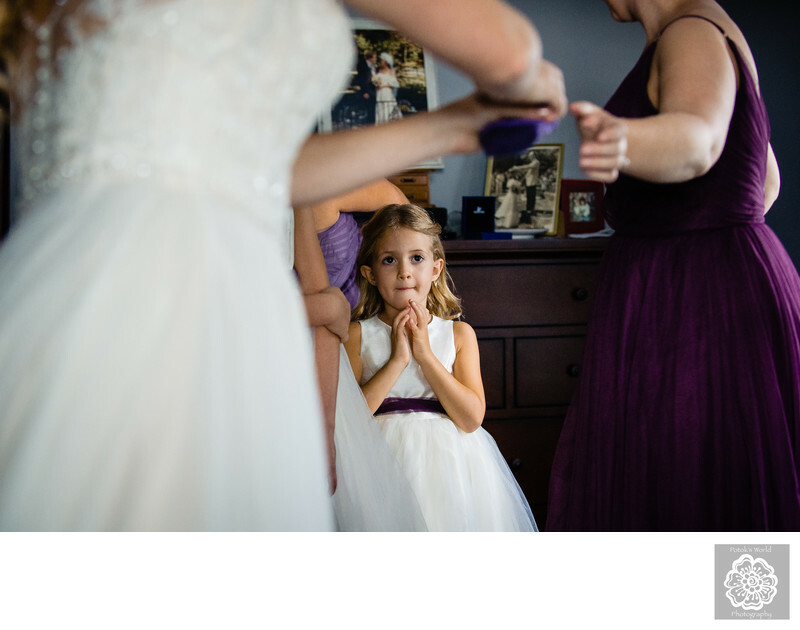 As she twirled around, her young niece was watching her, perhaps dreaming about her own wedding day. That was not the whole story, though. A third generation is present in the background of the image. Behind the crowd of bridesmaids is a photo of a woman in a wedding dress. Because this bride chose to get married at her parents’ farm, the woman in the photograph is, unsurprisingly, the bride’s mother. So in a very indirect way, the bride, her niece and their mother/grandmother shared a beautiful wedding experience. As Washington, DC, wedding photographers, we live to deliver these kinds of images to our clients. Location: Cedar Ridge Farm (The Linde Farm). 723 Streaker Rd, Sykesville, MD 21784.